Nineteen-forty-two, as we have seen, brought a boom in Russian phrasebook business, and Hungary did not miss the international trend. 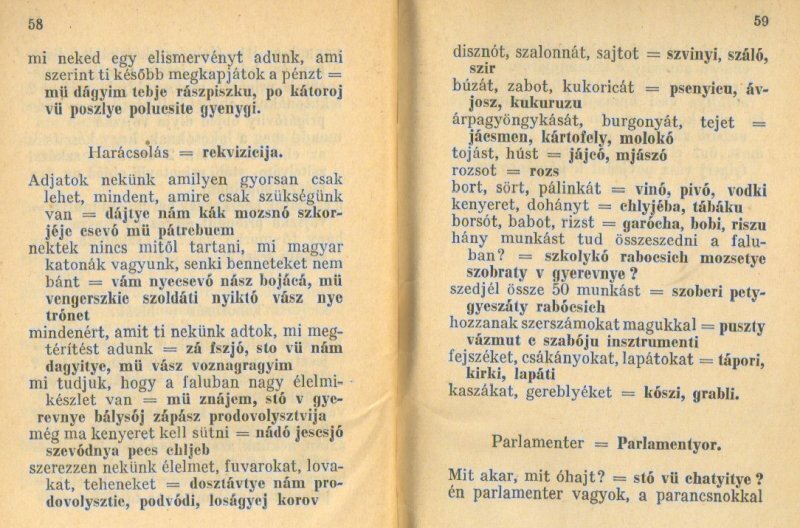 Having declared, on German pressure, war on the Soviet Union on 26 June 1941, in 1942 they published a Hungarian-Russian phrasebook for the troops on the Eastern front. We have found only one page of it on the Russian net. 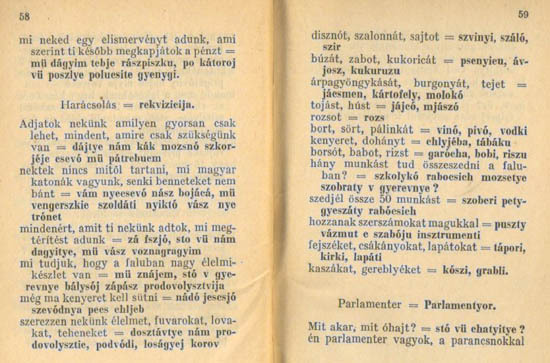 The booklet gives the Russian equivalents of the Hungarian terms in Roman characters and according to Hungarian pronunciation, including some errors. Below we transcribe them in Cyrillic together with their English translation for an easier evaluation. We’ll give you a receipt, on which you will receive the money later. Give us all what we need as soon as possible. You don’t have to be afraid, we are Hungarian soldiers, nobody will harm you. We will pay for all what you give us. We know that in the village there is a large supply of food. You must bake bread still today. How many workers can you get in the village? scythes, rakes Мы дадим тебе расписку, по которой вы после получите деньги. I can understand why they didn't do it that way, but in order to be maximally useful a phrasebook of that kind would have a section including things like "Don't shoot! We surrender!" and "All Hail the liberating Red Army!" and perhaps "The Hungarian forces went in that direction!" Obviously this was not easy to include in a phrasebook accompanying a presumably (and for a while virtually) successful offensive. But never mind, the helpful enemy did publish and distribute among the invaders the missing sections of the dictionary. Todas sus imagenes son hermosas,diferentes a todo lo que se ve normalmente en la Web. Le agradezco mucho por compartir este bello testimonio de la historia.